When you first install Word Saerch Printer, you will receive the program as a Free Trial. The Free Trial version can be used as long as you want, but as it does have some important limitations (principally that puzzles and solutions are overprinted with "Unregistered"), is really intended so that you can evaluate the program and see if it is for you. Click this button if you have not registered before. Your web browser should open at wordsearchprinter.com where you can complete the online registration process. At the end of the process, you will be given a Key code. Click this button if you have registered before. 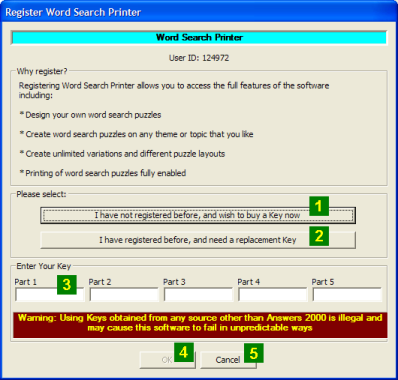 Your web browser should open at wordsearchprinter.com, where, provided you can show proof of a previous purchase, you can receive a replacement registration Key code. This option is useful is useful if you have switched to a new PC, and wish to move your license over without purchasing a new copy of the software. After you have obtained a Key code from our web site, you should enter it into the fields provided. Please note the Key code consists of five parts, each consisting of 5 upper case letters, and all five parts must be entered correctly. After you have entered the Key code, the OK button will become ungreyed. When you click it, the code will be verified, and if correct, the program will become registered. If it is incorrect (usually a typing error), you will need to carefully check, and enter the correct Key code. If you decide that you do not wish to complete the registration process, simply click Cancel to close the dialog box.